HomeNewsPavePro Video Contest! 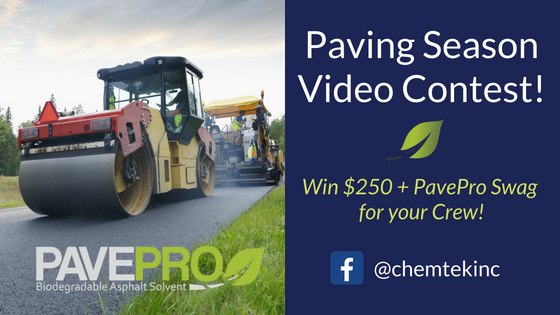 – Win $250 and PavePro Swag for your Crew!HomePavePro Video Contest! 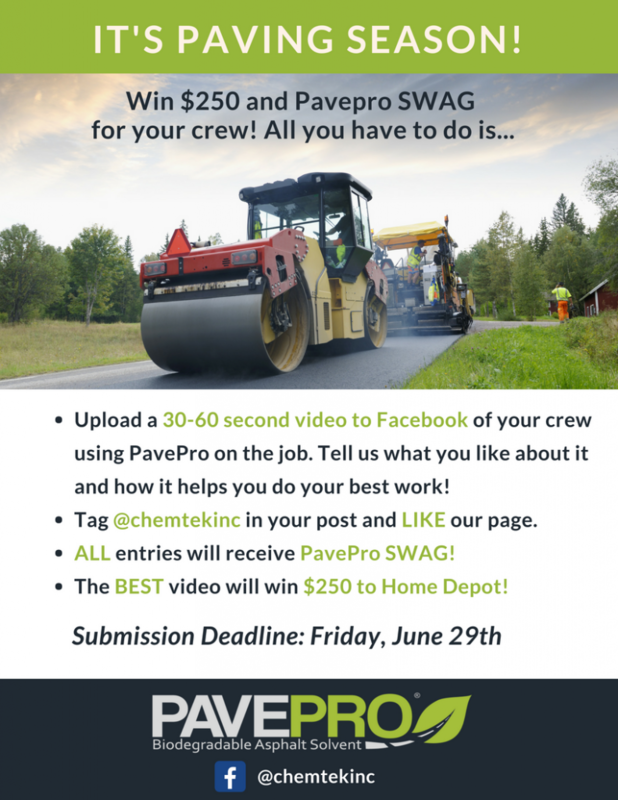 – Win $250 and PavePro Swag for your Crew!HomePavePro Video Contest! – Win $250 and PavePro Swag for your Crew! PavePro Video Contest! – Win $250 and PavePro Swag for your Crew! Attention PavePro Customers! It’s paving season and we want to see how you’re using PavePro! You can win PavePro Swag and a $250 Home Depot gift card for your crew when you post a 30-60 second video showing your crew using PavePro and explaining how it helps you do your best work. Like our Facebook page and tag us @chemtekinc in your video post. See below for details! Comment or send us a message on Facebook with questions. Entry deadline is Friday, June 29th. Chemtek specializes in creating, manufacturing, and selling industrial maintenance chemicals that are safe, effective, and sustainable.